A former Navy attorney who helped lead the military investigation of the 1967 Israeli attack on the USS Liberty that killed 34 American servicemen says former President Lyndon Johnson and his defense secretary, Robert McNamara, ordered that the inquiry conclude the incident was an accident. In a signed affidavit released at a Capitol Hill news conference, retired Capt. Ward Boston said Johnson and McNamara told those heading the Navy's inquiry to "conclude that the attack was a case of 'mistaken identity' despite overwhelming evidence to the contrary." Boston was senior legal counsel to the Navy's original 1967 review of the attack. He said in the sworn statement that he stayed silent for years because he's a military man, and "when orders come ... I follow them." He said he felt compelled to "share the truth" following the publication of a recent book, "The Liberty Incident," which concluded the attack was unintentional. 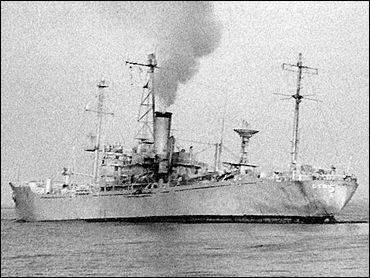 The USS Liberty was an electronic intelligence-gathering ship that was cruising international waters off the Egyptian coast on June 8, 1967. Israeli planes and torpedo boats opened fire on the Liberty in the midst of what became known as the Israeli-Arab Six-Day War. Israel has long maintained that the attack was a case of mistaken identity, an explanation that the Johnson administration did not formally challenge. Israel claimed its forces thought the ship was an Egyptian vessel and apologized to the United States. It was "one of the classic all-American cover-ups," said Ret. Adm. Thomas Moorer, a former Joint Chiefs of Staff chairman who spent a year investigating the attack as part of an independent panel he formed with other former military officials. The panel also included a former U.S. ambassador to Saudi Arabia, James Akins. "Why in the world would our government put Israel's interest ahead of our own?" Moorer asked from his wheelchair at the news conference. He was chief of naval operations at the time of the attack. Moorer, who has long held that the attack was a deliberate act, wants Congress to investigate. Israeli Embassy spokesman Mark Regev disputed any notion that Israel knowingly went after American sailors. "I can say unequivocally that the Liberty tragedy was a terrible accident, that the Israeli pilots involved believed they were attacking an enemy ship," Regev said. "This was in the middle of a war. This is something that we are not proud of." Calls to the Navy seeking comment were not immediately returned. David Lewis of Lemington, Vt., was on the Liberty when it was attacked. In an interview, he said Israel had to know it was targeting an American ship. He said a U.S. flag was flying that day and Israel shot it full of holes. The sailors on the ship, he said, quickly hoisted another American flag, a much bigger one, to show Israel it was a U.S. vessel. "No trained individual could be that inept," said Lewis of the Israeli forces. In Capt. Boston's statement, he does not say why Johnson would have ordered a cover-up. Later in a phone interview from his home in Coronado, Calif., Boston said Johnson may have worried the inquiry would hurt him politically with Jewish voters. Moorer's panel suggested several possible reasons Israel might have wanted to attack a U.S. ship. Among them: Israel intended to sink the ship and blame Egypt because it might have brought the United States into the 1967 war.